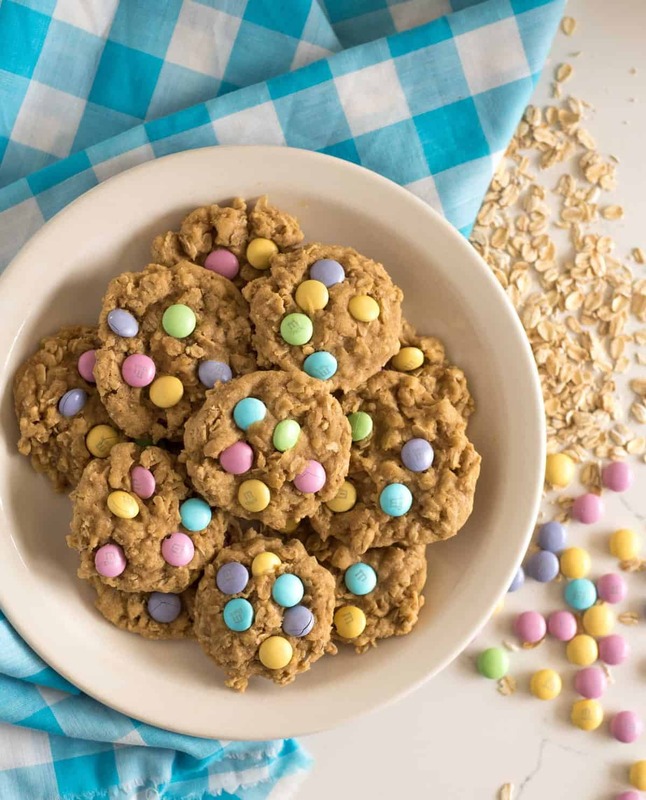 Oatmeal cookies made with butter and brown sugar, topped with colorful M&M candies to make the cutest spring dessert; plus they taste great too! I love oatmeal cookies with my whole heart. I find myself making just a handful of cookies over and over again and I never tire of them. 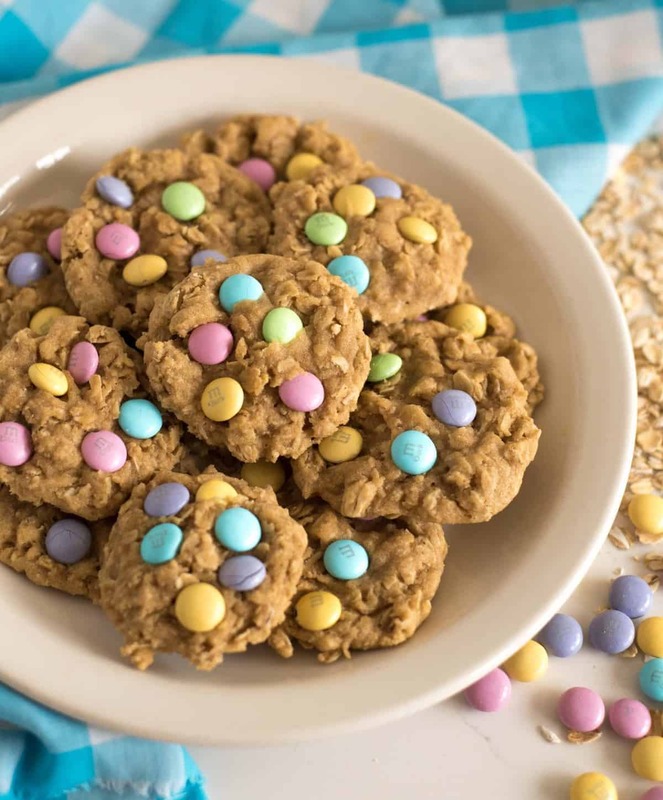 My favorite chocolate chip cookie recipe is on repeat almost weekly and then there is this super simple recipe for oatmeal cookies. It’s made with a heavy hand of butter and brown sugar, a little flour and oats, and lots of love. This version has M&M’s in it and it’s a favorite for two reason: 1. Chocolate makes everything better. 2. 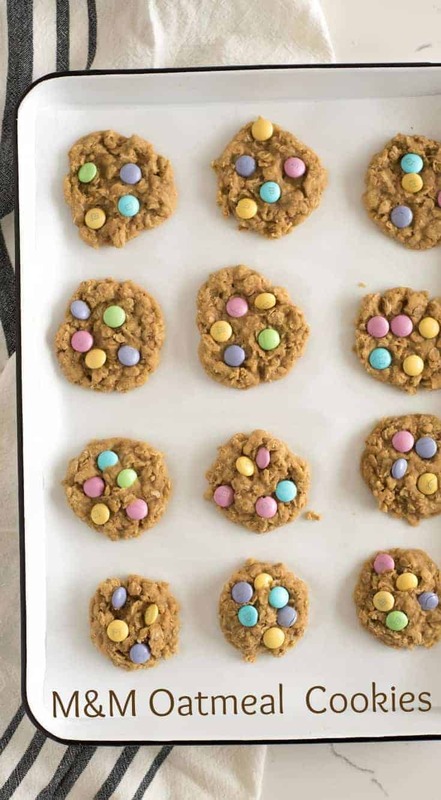 I love using seasonal M&M’s to make cute cookies without any added effort on my part. Seriously though, why are seasonal M&M’s so cute? 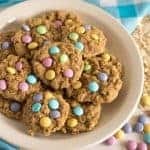 I love these oatmeal cookies because they are just the right mix of soft and crisp, and sweet and simple. They always turn out perfectly and they come together in a snap. These are the kind of cookie that you can depend on because they just don’t let you down. 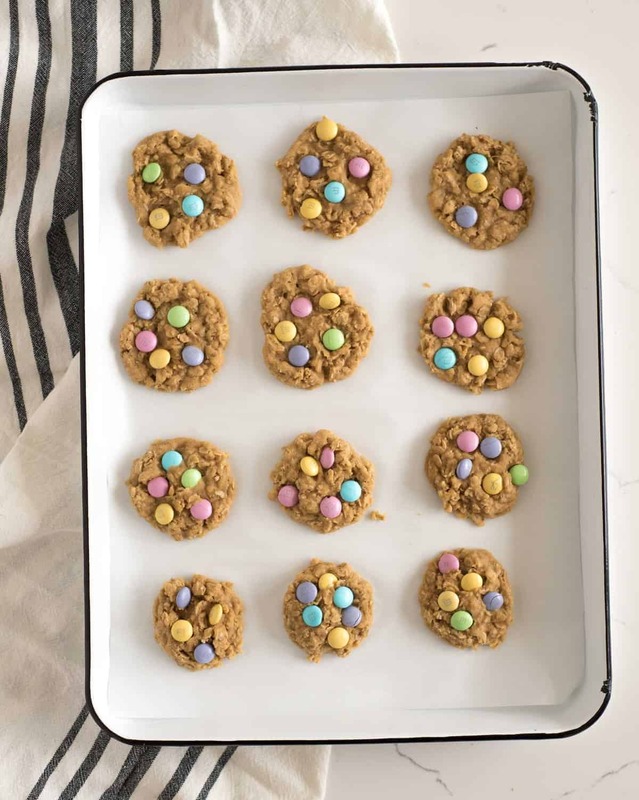 They are also a great candidate for after school baking/snacking because a batch makes about 3 dozen cookies which means you’ll have enough to feed your kids plus the friends who filter in the door, but not so many that you’ll be tempted to eat them for breakfast for the next week. But don’t worry if you do decide to eat oatmeal cookies for breakfast, they have whole grains and eggs in them… practically breakfast food in my book. 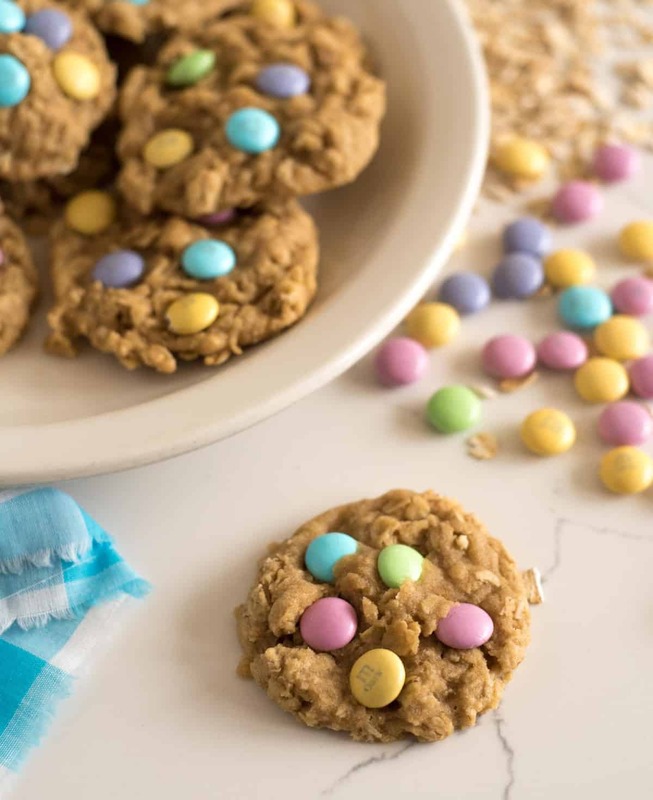 Enjoy these with a cold glass of milk and get your kids in on the sticking-M&M’s-on-the-top-to-look-cute part. That’s always the part my little people love. Be warned though, they seem to eat as many M&M’s as they stick on the cookies – plan on buying double what you need. The fun part about using M&M’s is that you turn a normal cookie into a cute seasonal cookie just by purchasing seasonal M&M’s! Use traditional M&M’s for everyday cookies, Christmas colors for the holidays, fall colors for well, the fall. So simple and pretty! I like to have a few extra M&M’s (or save some from the 2 cups called for in the recipe) and press them into the cookie dough balls before baking. You can see more of the candy that way and they look extra cute. My kids love helping with this part. You can use old fashioned oats here or the quick cooking oats. Did you know that they are both whole grain oats, but the minute oats are just cut into smaller pieces? You’ll end up with a chewier texture with the old fashioned oats and a more uniform texture with the minute oats. Both are great – use what you have. Don’t be tempted to replace the butter in this recipe with something else. It mixes with the brown sugar and the taste is delicious. I’m on team baking mat. Do you have one yet? Other cookie recipes that I love and make over and over include the best chocolate chip cookie recipe ever, Soft Gingerbread Cookies, and Healthy Applesauce Cookies. All good choices. 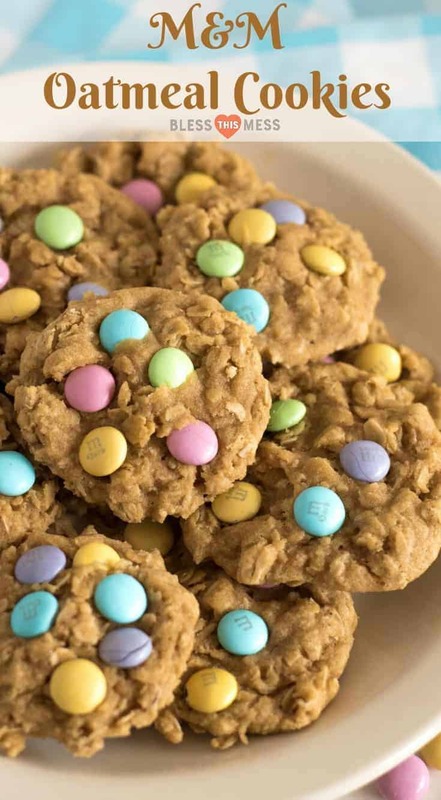 Homemade oatmeal cookies topped with colorful M&M’s candies to make the cutest cookies on the block; plus they taste great too! Add the M&M’s and stir until they are just mixed in. Use a cookie scoop to make a ball from 1 tablespoon of cookie dough and place on prepared cookie sheet 2 inches apart. I like to have a few extra M&M’s (or save some from the 2 cups called for in the recipe) and press them into the cookie balls before baking. You can see more of the candy that way and they look extra cute. This is one of those recipes that you are going to make over and over again, and I can’t wait for you to get started down that path. You can’t beat a tried-and-true cookie recipe and this, my friends, is just that. Oh, so cute! I just love those pastel M&ms!